14 Tooth Replacement Chain fits ONLY Lancelot #45814, #47814 and #41414 Discs. 14 Tooth Chains are not interchangeable with 22 Tooth Discs. Don't want to stop and sharpen your chain? Keep an extra chain on hand, change it out and and sharpen after your day is done! 22 Tooth Replacement Chain fits ONLY Lancelot #45822, #47822 and #41422 Discs. 22 Tooth Chains are not interchangeable with 14 Tooth Discs. Don't want to stop and sharpen your chain? Keep an extra chain on hand, change it out and and sharpen after your day is done! 12 Tooth Replacement Chain fits ONLY Squire #35812, #37812 and #31412. 12 Tooth Chains are not interchangeable with 18 Tooth Discs. Don't want to stop and sharpen your chain? Keep an extra chain on hand, change it out and and sharpen after your day is done! 18 Tooth Replacement Chain fits only Squire #35818, #37818 and #31418. 18 Tooth Chains are not interchangeable with 12 Tooth Discs. Don't want to stop and sharpen your chain? Keep an extra chain on hand, change it out and and sharpen after your day is done! The 47814 model 14 tooth Lancelot chain saw cutter fits most 4 1/2" (115mm) angle grinders with 7/8" (22mm) center holes. More aggressive than the 22 tooth and leaves a coarser finish but you’ll be amazed at the smooth finish. Excellent for rapid wood removal, cutting and general shaping. The 12 tooth Squire chain saw cutter fits 4 1/2" angle grinders with 7/8"(22mm) center hole. More aggressive than the 18 and 22 tooth and leaves a courser finish but you’ll be amazed at how smooth the finish is! The 18 tooth Squire chain saw cutter fits 4 1/2" angle grinders with 7/8"(22mm) center holes. Not as aggressive as the 12 and 14 tooth and leaves a fine finish. Excellent for rapid wood removal, cutting and general shaping. The 22 tooth Lancelot chain saw cutter fits 4 1/2" angle grinders with 7/8"(22mm) center holes. Not as aggressive as the 14 and 12 tooth and leaves a finer finish but you’ll be amazed at the power and control. Excellent for rapid wood removal, cutting and general shaping. Quality made, long lasting tungsten carbide disc for the home and Do-It-Yourself market. This tools’ many uses are only limited by your imagination! For general jobs around the house, nothing shapes wood better. Anytime you need to get a final shape, whether flat or contoured, Galahad CG® discs are your answer. Versatile Carbide Abrasive Sphere Burr fit flex shafts, mini die grinders and air grinders. Sphere Burr (11007) with 1/4" shank x 1" diameter. Also available for European 6mm collets. Our Universal Nut has been re-engineered with a recessed back. 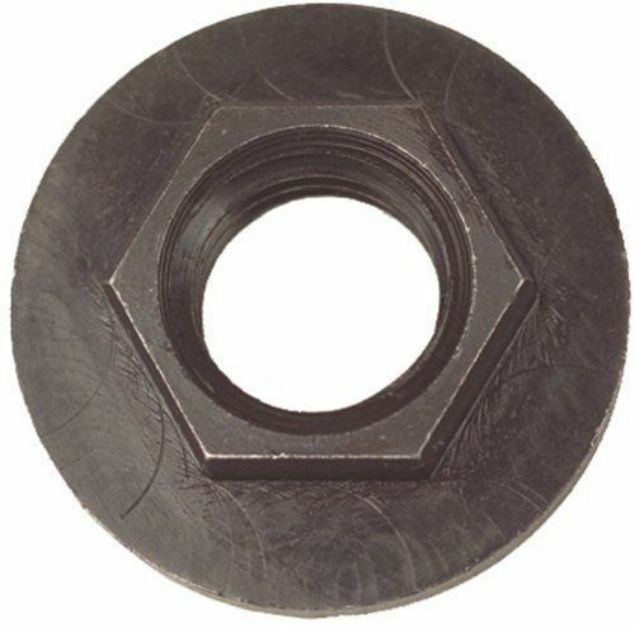 Now you can securely tighten ALL King Arthur's Tools to your angle grinder with this truly "Universal Fit" nut. UNIVERSAL NUT recessed back allows disc to be tightened on different size angle grinders. Choose either a 5/8" or 14mm center Universal Nut. Holey Galahad® with 7/8 (22mm) centers fit both 4 1/2” (115mm) and 125mm center sizes AMERICAN & EUROPEAN Angle Grinders with the appropriate Universal Nut. NOTE: Only blades with 5/8" (16mm) and 14mm center hole sizes may be tandem mounted. Hex Nut Wrench fits all power tools with 5/8” or 14mm spindle thread shafts.